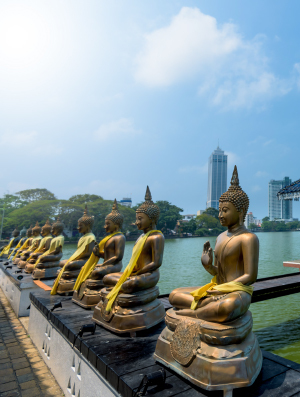 Experience the highlights of this emerald island nation in the Indian Ocean with our luxury 12-day Classic Sri Lanka itinerary. Soak up the culture, history and landscapes as you visit Colombo, Dambulla, Kandy, Nuwara Eliya, Bogawantalawa Valley, and Galle, staying at some of the most luxurious hotels the country has to offer. Upon arrival at the Bandaranaike International Airport you will be met and assisted by a Sri Lankan Airlines staff who will hold a board with your name as you exit the aircraft. You are accompanied through passport control, customs, baggage collection and money changers, all the way to the arrival lounge where the Luxe representative will meet you, address any last minute questions you have about the itinerary and introduce you to your private chauffer guide who will be your travel companion and explorer guide around Sri Lanka. Transfer to your hotel and check-in. Overnight at hotel. Start after breakfast and drive to Dambulla, a 4-hour drive. 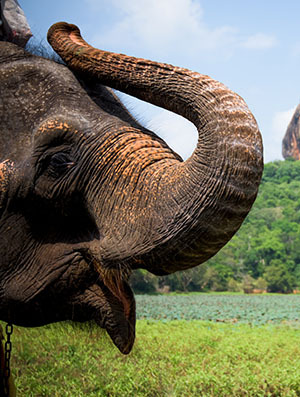 On the itinerary today is a visit to the two famous UNESCO sites: Dambulla Cave Temple and the Sigiriya Rock Fortress. Dambulla caves are the most impressive of Sri Lanka’s cave temples. The cave complex houses over 2000 sq. meters of painted walls and ceilings, and over 150 images of the Buddha. The largest cave dates from the 1st - 2nd century B.C. and is quite breathtaking. The 5th century Sigiriya rock fortress, is another impressive UNESCO site and a massive monolith of red stone rising 600 feet from the green scrub jungle below. Fifteen centuries ago, this rock was the innermost stronghold of the 70 hectare fortified town and was crowned by the palace of the mad genius King Kasyapa. Though the palace no longer exists, the paws of the great lion which guarded the entrance to the summit are still intact, and a moat, rampart, and extensive gardens, including the renowned water gardens, ring the base of the rock. The world-renowned frescoes of the “Heavenly Maidens” of Sigiriya can be seen in a sheltered pocket of the rock approached by a spiral stairway. These frescoes are painted in earth pigments on plaster. The evening is at leisure. Overnight at hotel. Take a half-day trip to Polonnaruwa, another UNESCO site which is around 80 minutes away from Dambulla, and is a well-preserved ancient kingdom. In the 10th century, the Chola Kings of South India made Pollonnaruwa their capital after conquering Anuradhapura. 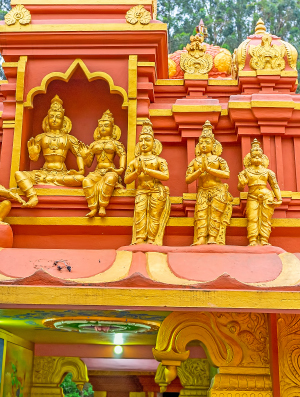 It was recaptured in the 11th century by the Sinhalese king Vijayabahu and flourished until the 13th century, when it fell once more into the hands of South Indian kings. Round off the day with a safari at the Minneriya National Park, set around a 3rd century reservoir, Minneriya and is a haven for wild elephants and birdlife. Here, Ceylon fish owl and sea eagle are amongst the species you may see. Return to your luxury hotel to relax for the evening. Overnight at hotel. 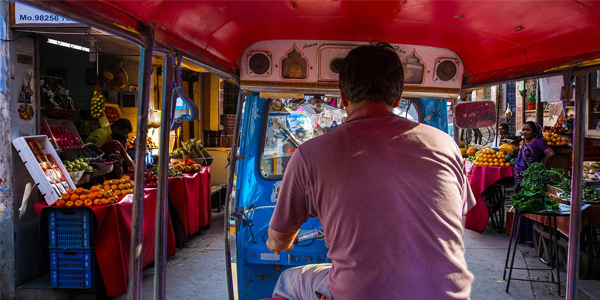 The next leg of your trip will take you to the lush green city of Kandy (2 hours away), the island nation’s cultural capital. This was the last kingdom of Sri Lanka. 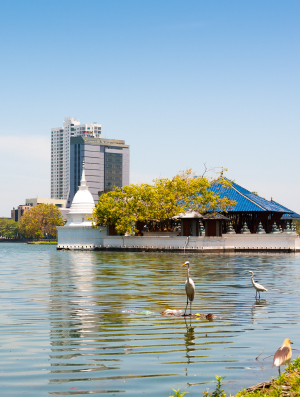 In the afternoon we take you for a stroll around Kandy and its pretty lake. 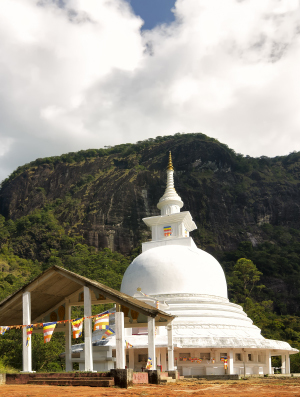 Towards the evening visit Sri Lanka’s most sacred site, the Temple of the Tooth. 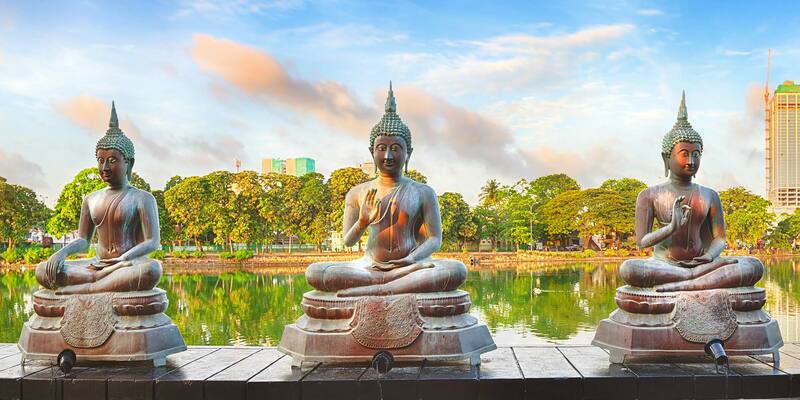 Tradition relates that a sacred tooth relic of the Lord Buddha was brought to Sri Lanka in 4th Century A.D. and was enshrined within the Dalanda Maligawa, or the Temple of the Tooth. This sacred relic has been the symbol of sovereignty ever since for the Sinhalese kings and always enshrined in great splendour. 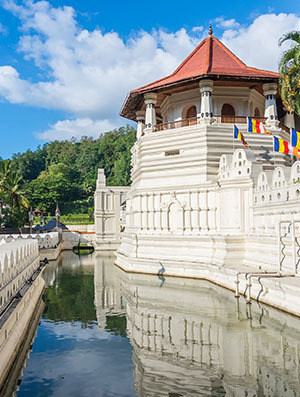 Kandy’s Dalada Maligawa is a magnificent shrine, with decorative walls, golden roof and fine woodwork. Religious services (pooja) are held daily at dawn, midday, and in the evening and can be viewed by visitors. The services are accompanied with traditional music and drumming. Overnight at hotel. Start after breakfast and visit the lovely Botanical Garden of Kandy. Conceived as a Queen’s pleasure garden in the 14th century, and a Kandyan Prince’s residence in the 18th century the gardens were formally opened under their current guise in 1821. After the visit, set out by road for Nuwara Eliya. The 2 hours taken by the long drive are very scenic as you pass through lush green rolling hills making your way to hill country. En route stop at temple where, according to the legend, Sita, wife of the Hindu God Rama, prayed to him to rescue her from the evil King Ravana. 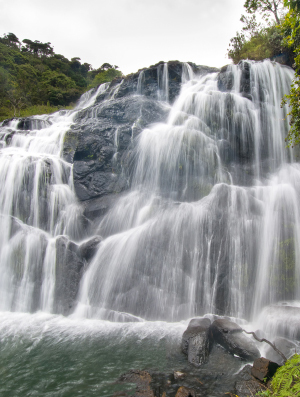 Enjoy a fresh picnic overlooking the picturesque waterfalls nestled among the hills before continuing your drive. Arrive at your charming hotel by early evening. Overnight at hotel. Today, you continue your journey and your next stop is Bogawantalawa Valley, around 2 hours' drive away - a small town known for its tea estates. 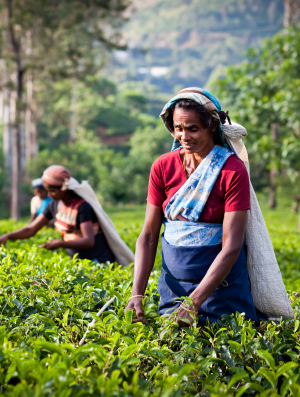 In the afternoon set off for the Ceylon Tea Trail that takes you through a working plantation. Get the royal treatment and feel refreshed at a tea tasting at the plantation. Return to your luxury bungalows for dinner. Overnight at hotel. A 3 hours’ drive this morning takes you to Tangalle. 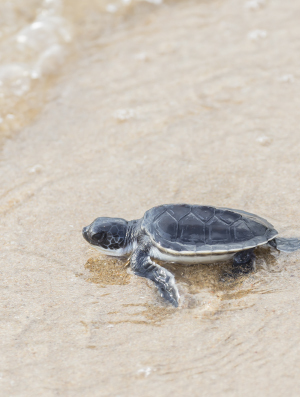 Here, you’ll have the once in a lifetime experience of watching baby sea turtles hatch on an isolated beach. The Rekawa Turtle Conservation works to preserve marine life and promote the turtles living in their natural habitat. This is a unique, intimate experience not soon forgotten. After the visit, try your hand at an interactive cooking session learning the secrets behind some of the flavorful local Sri Lankan dishes. Enjoy the fruits of your effort as you sit down to lunch after the lesson and sample what you have cooked. Post lunch drive to Galle, approximately 2 hours away. The evening is at leisure. Overnight at hotel. This morning take one of the unique walking tours with a local expert. 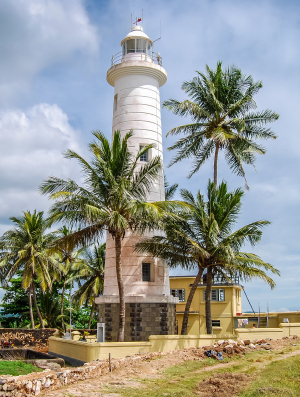 Expect the unexpected on one of the eccentric Galle Fort walking tours which will take you into a maze of hidden backstreets, revealing secret unknown spots, extravagant 18th century merchant houses complete with ostentatious gold bedrooms, lavish pools and characters akin to Hemmingway. Wrap up the day by paying the Yatagala and Rhumasala temples a visit. Overnight at hotel. Spend the day marveling at the world’s wonders as you embark on a whale watching tour. In the afternoon set off for a hike in Hiyare. One of the best-kept secrets of the South, the forest is alive with wildlife. The forest patch is an environmentally special and sensitive area as it houses some rare and endemic fauna. The Wildlife Conservation Society - Galle, has set up their office, animal hospital and a research center near the reservoir where they dedicate their efforts towards the forest’s conservation. Return to your hotel by evening and enjoy a sundowner followed by an exclusive and private dinner as you toast the last evening of your trip through Sri Lanka. Overnight at hotel. The morning is at leisure. Based on the timings of your international flight, our colleague will meet you in the hotel lobby and assist in your transfer to the airport. 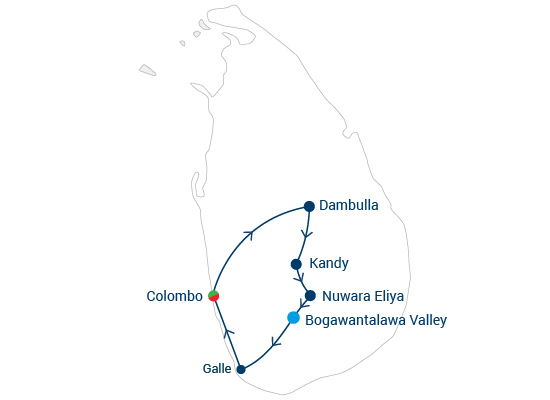 The drive to Colombo airport takes approx. 3 hrs. 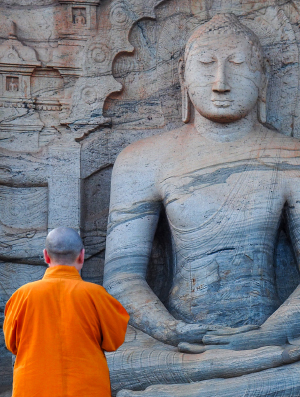 This itinerary is just a slice of what the island of Sri Lanka has to offer. 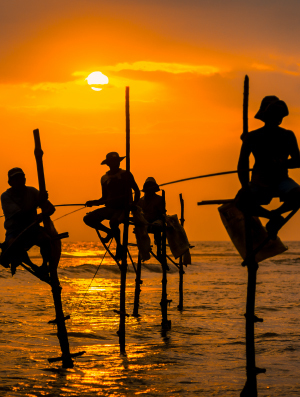 To quote the legendry explorer, Marco Polo, “Sri Lanka is the finest island of its size in all the world” and we hope that you will return soon to discover more.